Just to further illustrate some of these issues, I wanted to introduce a couple of simple concepts that I have found helpful. Back in the "old days" -- when computers were far less powerful, and we were limited to what could be done with "ASCII" -- it was common to create diagrams and drawings, using only a keyboard. In the study of computer science issues, I found this kind of diagramming to be very interesting. Back then, we didn't have this nearly-continuously-variable pixel distribution on our screens, with all this incredible range of fonts. Screen-space was a simple square matrix of rows and columns, and there was either "something" or "nothing" in every cell of the matrix. The "something" had to be chosen from a "finite-state alphabet" -- namely, the range available on the keyboard. There was no choice of font -- and the available font was not "proportional" (some letters wider than others); each letter simply occupied one cell in a strict rectangular matrix. Everything was black or white -- no color. Computers were a lot like typewriters. On/off. Basic. So, that meant, among other things, that every character on the screen had this interesting "figure/'ground" kind of ontology. Each letter of the alphabet was distinguished from every other letter -- by a finite set of distinctions that had to be defined in the pixel-set available within that particular matrix cell. The letter "A" was a particular distribution, as was the letter "B". Of course, that is still true today -- but it's much less apparent than it was back in the days of the simple square matrix. I used to find this kind of thing fascinating. All letters are composed of a particular set of pixels in a particular on/off combination -- and these particular combinations are combined into "strings" -- that we call "words". And out of these words -- are composed all the written thoughts of human civilization. This same concept can be rotated and illuminated with some critical additional detail. Here, a secondary concept of order is introduced. In a sense, this is now a 2-dimensional ordering -- the horizontal being "the level of abstraction" -- and the vertical being a classification of the semantic categories we use to describe these bounded levels. If "temperature" is measured by some "absolute linear index" (a thermometer), we can define some "ordinal variables" in words like "hot" and "cold" as boundary-value ranges on this linear index. For reasons of psychological economy, we don't say "it's between 50 degrees and 60 degrees". We say "it's cool". That's a "relabeling of a boundary value" -- without the exact specifics of measurement. If somebody says to us -- hey, what do you mean by "cool" -- we drop the level of abstraction down a notch or two, and give them the long-winded and more accurate version. Now, in this diagram, we take Koestler's hierarchy of holons ("holarchy"), from Maps of the Mind, and rotate it 90 degrees, to show this ordinality across the top of the diagram in the x/horizontal axis. These levels -- A, B, B, D -- correspond to the "levels of ordinality". 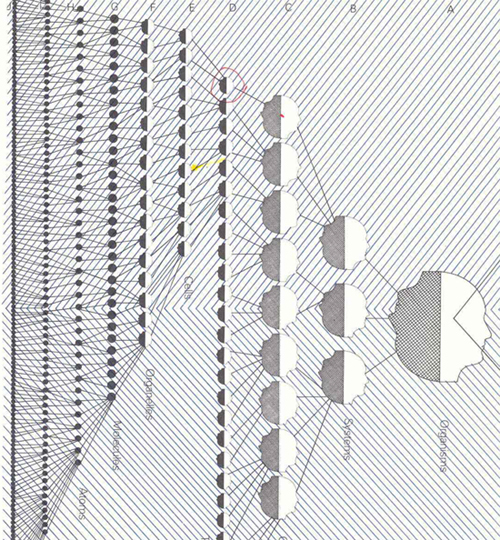 What this diagram adds to the taxonomic hierarchy/holarchy is the idea that all basic logic runs as "directed" processes across this grid -- "up and/or down the hierarchy". "Induction" and "Deduction" are opposite directions on this grid. This is a mouthful, I know. Here's a link to a brief review of this concept of "levels of variable types"